View More In Hair & Scalp Treatments. WASH: Wash the hair with Step 1 Shampoo for deep cleansing. Virgin/Coarse hair: Leave Step 1 Shampoo on the hair for 5 minutes, rinse ends. Leave 5 additional minutes. Rinse thoroughly. Chemically treated hair: Leave Step 1 Shampoo on the hair for 3 minutes, rinse ends. Leave 3 additional minutes. Rinse thoroughly. BLOW-DRY: Towel dry the hair and blow dry up to 80% with hot air. APPLICATION: Divide the hair into 6 even sections. Rotate the product and start from the base of the head sections. Apply Step 2 Thermal Hair Reconstruction with long deep strokes outside of the first section and in the middle, comb and repeat the process in the next section. Blow dry every two section with cold air and apply tension using only your fingers. Avoid touching the hair with the blow-dryer. Repeat the same process until finished. Blow dry the hair away from the face. FLAT IRONING: Divide the hair in three sections, work with 1/4" section at a 90 degree angle from scalp. Flat iron with tension from root to midshaft. Repeat from midshaft to end. FINISH: Rinse the hair thoroughly (do not shampoo). Towel dry and apply Step 3 Sealing Mask on the hair and scalp. Leave on the hair for 5-10 minutes. Rinse and blow-dry with hot air using your fingers. 100% Satisfaction guaranteed... Improve your hair... Improve your life! Thermal Reconstruction treatment for all hair types. It provides healthy, straight, shiny and frizz free hair with the exclusive "Easy Straight Method" for up to 3 month. 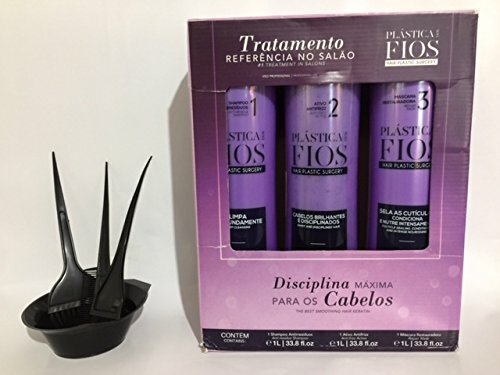 If you have any questions about this product by Plastica dos Fios, contact us by completing and submitting the form below. If you are looking for a specif part number, please include it with your message. Nioxin Intensive Therapy Hair Booster 100 Ml/ 3.38 Fl. Oz. For Thin-looking Hair "Pack of 6"